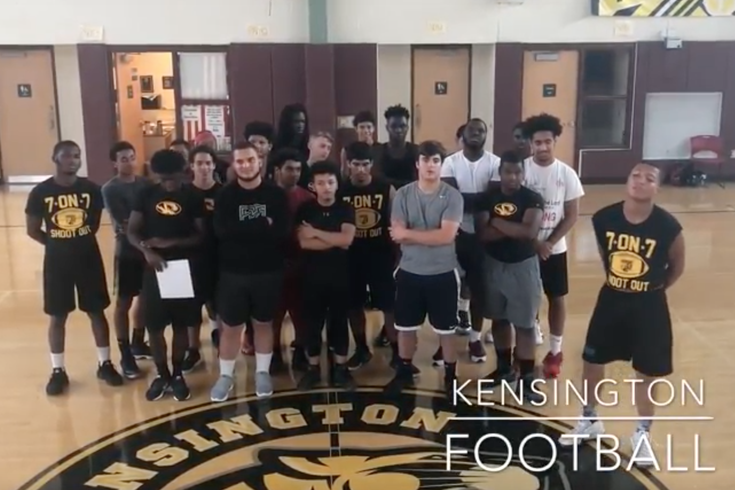 It’s been a whirlwind 72 hours for Justin Young, an assistant head coach for Kensington High School’s football team. On Tuesday morning, his team had no jerseys, no pads, no socks, no training equipment, and just $225 collected from the fundraiser the team had started to replace all the equipment lost after its storage shed was raided by drug users looking for money and shelter. Early Friday afternoon, Young sounded like a new man on the phone as he described the overwhelming support from Philadelphians near and far. The Kensington Tiger's fundraiser originally hoped to raise $4,000, even though Young estimated it would take $16,000 to fully replace what had been taken. The online fundraiser has since passed the $10,000 mark, and with other donations outside the internet, they’ve amassed more than $20,000 in support. “It really, really took off,” Young said. On Wednesday evening he spoke with U.S. Rep. Bob Brady, who represents Pennsylvania's 1st Congressional District. Brady had seen media coverage of Young and his team, and said he didn’t want to ignore their plight, so he pledged $8,000 to help the team out. Young said when Brady called he was overwhelmed — “I don’t have any words,” he said shortly after — and offered to get in his car and drive to Brady’s office that minute if that’s what was necessary. Instead Young drove to Brady’s office on Thursday to pick up the check and chat about his football program, which Young calls underfunded. “He made a phone call right there for me, called downtown about getting a retaining wall built and getting a fence in there,” Young said. But even Brady couldn’t compete with the call Young got late Wednesday night. He answered his phone — a phone that’s been buzzing nonstop with media requests since Tuesday — and, to his surprise, heard Philadelphia Eagles tight end Zach Ertz’s mother, Lisa, on the other end. Young chatted with Ertz’s mother, and then Ertz himself. "It's just like, bada-boom, I'm talking to Zach Ertz on the phone," Young said. "It was unbelievable." The two had heard his team’s story and, through the Ertz Family Foundation, wanted to help Young out. They offered $4,000, and said their goal is to outfit 40 of Young’s players, head-to-toe, this season. Now comes the hard part, Young said – actually acquiring the equipment in time. So they’re not all the way back at full strength just yet. But Young will gladly deal with the headaches of ordering equipment rather than the nightmare of having none. The Kensington Tigers’ first scrimmage is Aug. 18 against Strawberry Mansion.